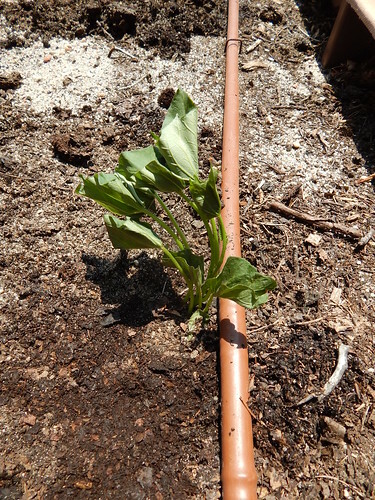 We received our Sweet Potato slips last Thursday, and I stuck them in right away. We were planning to plant 2 varieties in the raised bed: ‘O’Henry’ and ‘Beauregard.’ We also received some NC Japanese that I wasn’t planning on. I stuck a couple of those slips in the area where we tried to plant rhubarb, just to have something to take that space this year. As I showed you last Friday, this is how we got the slips. They are good and healthy! 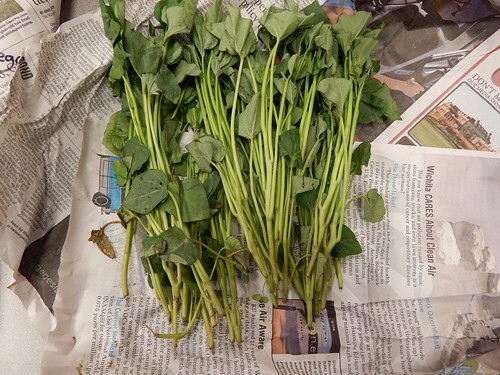 These “slips” are shoots that were cut off of sprouted sweet potatoes from last year. Each slip will quickly root and grow into a large plant. 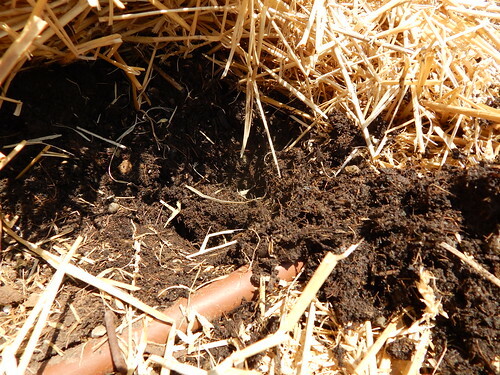 This is the hole I dug in Bed 9, where there was straw mulch on top of the Raised Bed Mix. It was nice and moist! 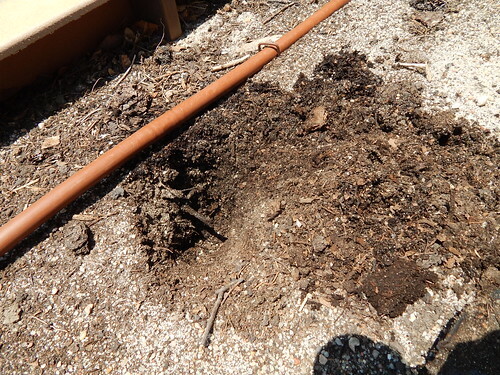 This is the hole in Bed 10 which is much sandier soil mix. You can see the darker soil right by the emitter that I had turned on, but you can also see that the soil is very dry otherwise. 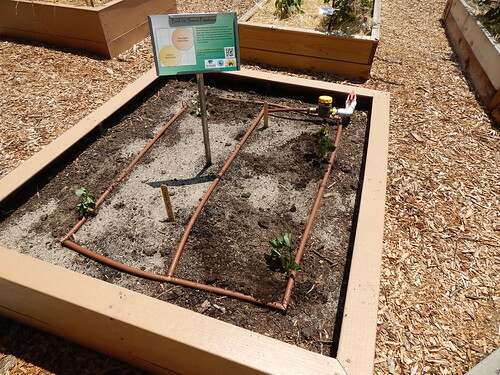 It is clear to see the benefits of mulch and more organic matter in a sandy soil. Okay, enough of the digression about the different soils and how dry they were. Here’s one of the planted slips. I gave it an extra drink of water after planting. It is still looking pretty good, despite the heat. A couple hours later it was all flopped over and wilted. I planted two slips of both varieties in this bed, roughly in each corner near an emitter. I planted the two NC Japanese slips in the bed with the horseradish. We probably could have gotten away with only planting 2 or 3 slips in this space. It will be fun to see how filled up with sweet potatoes this bed is by the end of the summer! Now it’s Monday, and the plants were no longer wilted. They were nice and straight, but still not looking great. On closer inspection, one plant is basically a twig. This one had a whole cadre of roly polys on the leaf. UGH! I know it rained last night, but this is ridiculous. Once the vines take off and start growing it won’t be a concern. For now, I hit them directly with a little neem oil/pyrethrin spray. We’ll keep an eye on them, but I think they will take off by next week. 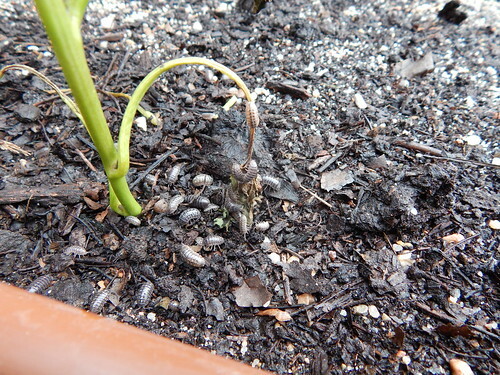 Posted on June 17, 2013, in Around the Garden and tagged insects, planting, sweet potatoes. Bookmark the permalink. 1 Comment.